I am going to downsize from a 32' Class A to a small (24' to 27') Class C with one or two slides. We are not full-timers. 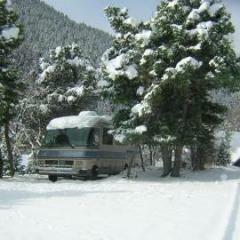 We make some short trips and usually spend one 2 month time period camped during the year. I have never pulled a toad and do not want to do it now. We have always driven the car separately or driven scooters. 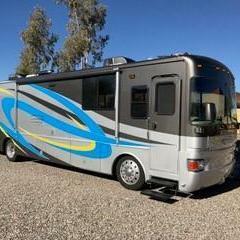 What is the longest RV can I get & still be comfortable driving it around town, such as going to grocery store or a museum? This will force me to disconnect every time we want to go somewhere (we are not the type to just sit and relax). I don't think this would be a problem, but my partner has already expressed some doubts. She is responsible for getting the inside ready, while I am responsible for the outside. Any thoughts about this? I don't know what else to ask, so if you have some experience you can share I would appreciate it. I would think a van conversion would be about as big as you wanted to go for a daily driver in town. Welcome to the forum. Why haven't you had a toad? Why are you making your poor DW drive the car? If you don't have a toad you are giving up over 80% of the things you can do on a trip. Keep in mind many places will ticket you if you don't fit in the marked space or stick out to far on the street side. Like DD said any thing over a small van conversion is a problem to get around in in town. "This will force me to disconnect every time we want to go somewhere" Help me out here. Less than 2-3 min to disconnect the toad verses disconnecting the coach breaking down and storing everything. Then having to re set up when you get back. You can leave the toad disconnected until you are ready to leave. You would rather drive something to go shopping or sight seeing that gets 5-6 mpg in town or less verses a toad that gets over 30+ MPG. As you don't have you coach in your signature I don't know what it is. I would stick with a Class A and upgrade as it seems you want slides. You will have more storage, bigger tanks more room. By the way this is from experience-- not I think or I heard it on the internet. A toad is convenient. However I'm a Dinosaur in the Motorhome . Never had anything besides Class A, in the late 1960's to 1981, we did not have a toad, did not know what a toad was. We had 18 foot to 31 foot and unhooked each time we needed to go for Laundry, shopping or sightseeing. It was a way of life and no problem! In 1981 we had an Apollo 3100 and had a custom made lift made for the front to carry 2 Honda 80cc scooters! WOW !!! The freedom! In 1983, we had a Apollo 3300 that had the Hondas in front and in 85' we added a Isuzu trooper II as a Toad. In todays market, where most Class C's and A's are 102 inches wide, instead of 96 inches above, with no slide out. I would have to agree with DD69...your limited due to 102" wide! We downsized to a small, 25 foot, no slide out, Class C and dumped the TOAD...and don't miss it a bit. For most trips we do not need a TOAD as we can visit every where we want to go in our Class C. But then we are not "campers", we use our Class C to tour so we are generally moving on every day or two. When we are going to be in a single spot for several days, with a lot of local or nearby attractions, I just call Enterprise and they deliver a rental car. Having tried both I'm happy without a TOAD. The smaller Class C is pleasant to drive, handles well, is easy to park, and meets the 25 foot or less length requirements in some national parks. And I have yet to have a problem parking at a museum, driving in town, shopping etc...I'm sure there are some places I would but we haven't found one yet. And best yet my wife enjoys driving it...it's nice to get a break from driving! If you research small Class C you'll find the number of smaller units with a decent TOAD tow rating is fairly small. Most, but not all, M-B Sprinter based C's will be rated for around 3,500 pounds max tow weight. Ford Transit based units like ours are rated at around 2,000 pounds so almost any car is out... Forest River makes some E450 based 25 foot C's, like the Sunseeker GTS 2430S, that could easily pull a big TOAD. I'm having a hitch added to our new C to allow for using our bike rack, our bicycles will work in a lot of places as well. And a trailer with a Polaris Slingshot just may be in my future. Any thoughts? Every where you go and everything you want to do and see is going to require that you disconnect from shore water, electric and sewer? Why don't you/won't you take along a towed? Even scooters is better than nothing but, dang, scooters as your only option? You leave home for 2 months and the DW has to follow you around the Country in the car while you drive the RV? Sorry, I just don't see any reasonable answer to your question about length when I cannot fathom having to drive the house to the grocery store to pick up some olive oil. Understand your situation, been there and got the T-shirt...18 years of Class A's less than 30 feet, 96 inches wide and we had no problem with rigging down and being gone all day, then rigging back up! That's the way most everyone did it. 1967 - 1985! We did not know anything else! Yes, we did rent cars for extended stays, or in cities on the West coast (California) that did not then and still does not allow RV's in their city's....like Santa Monica! You have my best wishes for your future travels....enjoy! Actually, we have had two class A coaches (32' ad 33') since the mid-1990s, and never had a towed. We do take the coach to town to do shopping, and take it sightseeing and most destinations. We might consider it, if/when we full-time, but not on our current week-long, and weekend trips. We had a 32 ft Class A that we drove all around Branson, MO without a towed. The traffic was very heavy, other drivers were very friendly and let us make turns wherever we needed. We have a 27' Born Free Class C. No slides and it is 96" wide. We do not use a toad. If we are staying in 1 spot for some time we rent a car or can use Uber if in an urban area. Do not mind unhooking only takes a few minutes. I usually leave the water hookup at the campsite and take the electric cord with me. Electric cord is expensive to replace the hose is quite cheap. We generally do not hookup the sewer hose unless we are dumping. Have regretted not having a toad a few times like this past summer in Glacier NP. Would have liked to have driven on the going to the sun road but our coach is too big. Just about any coach is too big. Took a tour bus instead and had a great time. There have been a few cities that we couldn't park in over the years but can count those on 1 hand. We have had 24' to 28' motorhomes and have never used a toad. Currently we have a 28' Coach House and can go practically anywhere. Sometimes in cities, we have to park and find a trolley, bus, etc. That way we both can enjoy the scenery. Parking in parking lots has never been a problem - we usually near the back to we have plenty of space. Maybe that's one advantage to a bus conversion that still looks like a bus. We can park in the bus parking areas which are usually found near any tourist area. Otherwise, you're never too far from a Walmart or other box store that will let you park for a few hours. We can drive anywhere a city bus can go since we're only 35 feet long and 96" wide. The only thing to unhook when we leave a campsite is our electric, since we have no city water connections. I think that a smaller Class C would be fine for driving to town if needed - it's not much larger than some of the large pickups being sold today and could probably park just as easily. Camping without a toad depends on what type "camping" you do and how long you stay in one place. We just spent nearly four weeks in one spot at one campground. It's either have a toad, or break camp everyday to go out and about to sight see, eat, do tourist things, etc. For us, a toad is mandatory. I love all the people who rationalize how great it is to not have a toad. I traveled with out a toad in a small class C with no slides. Never again. The only way it works at all is going to one campground parking and staying put till you go home. I watch people with no toad breaking camp to do anything. We drove the going to the sun road 3 times and took the tour busses. I love the people who say "well we will just rent or take Uber" good luck, I did some research on this and the chances you can get a rental near a major attraction is slim and nun add in busy time of the season and . Last summer I was in Portland Maine, we watch some one in a small class C and a short A make about 5 passes through the port area trying to find some place to park. I had a hard time finding parking for my CR-V.
One of the best places that we go that a toad is not a necessity, is Pigeon Forge Tennessee. The trolley service is great, the CG that we stay at has a trolley pickup every 30 minutes and we have learned how to shuttle to many places around the towns, PF, Gatlinburg, and Severeville. We do carry a toad everywhere we go, but would be able to go there without one anytime. I'm sure that there is many other such places, just haven't looked for them. I have used it getting around in town because of the parking, there isn't any. We have stayed out on 321 at Smokey Bear. There are lots of places not covered by the shuttle. I don't recommend driving your coach over 441 to Cherokee. The only places that I can think of where you can get buy with out a car is The Grand Canyon National Park. If you can get into RV Village the shuttle bus will pick you up at the campground. Maybe at Zion as now you HAVE to use the shuttle buses to go up the canyon. Well ok you can walk. Toad less worked for us in the beginning when the kids were small. We destination camped mostly Jellystone's or a place with water or amusement parks attached. Disney is another place that we visited. It worked well for that, as they got older and we wanted to explore an area we tried "call enterprise we will pick you up", yeah that did pan out so well. To Bills point I can remember needing something, camp store didn't have it, I broke everything down wife and kids went to the pool I left with the coach to the grocery store. Came back set up I'd bet I blew a few hours for that debacle. Then along came a Toad, now I bring it if we need it or not, mostly because you just don't know when you will need it and our destination is now an area more so than the campground. For anyone considering going the "no toad" route, this was our experience last summer. Technically we had a toad because we had our Harley on a trailer. But there were several times when we were required to rent a car (wedding, rainy week, etc.). The first obstacle to renting cars is the price. 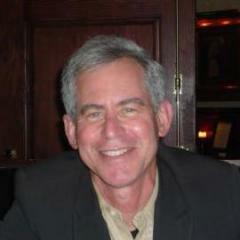 Generally speaking if you can do it on-line and well in advance you can stay around that $14.00 to $16.00 a day rate. But sometimes you get stuck at $25.00 to $30.00 per day, so it can add up. The other thing we found is that depending on what city/town you are in effects how good the rentals are. We were in the Peoria IL area and a couple of the cars a rental company tried to give us had stains on the seats and were nasty. They were new cars too! Anyway, traveling all summer it didn't seem like we rented a vehicle very often but ended up spending just under $900.00. My toad ... I never leave home with out it. It a wonderful Coach Pusher! Disney was the ONLY place --- and Massey's Landing in DE where I didnt need it. Everywhere else it was almost a necessity. If you want to eat, you need it, If you want to get beer (unless its a resort that has a store) you need it. IF you want to see the sights you kinda need it but keep in mind Uber cost more in most cases than a $2000 putter 5 speed with liability insurance. I have DW that likes Baskin Robins at 2AM so try getting a Lyft at that time of AM. I think Joe mentioned resorts like JellyStone and a few other places but lets face it, as soon as your kids get older and as soon as the DW gets the munchies its worth the few extra buchs in fuel to yank it down the road. I riley don't see any big decrease in mileage. Well to be truthful I have never ben on a trip with out a toad with this coach. I don't see it getting much better mileage than what I am getting now. I won't start a mileage thread so I won't say what it is. But I am happy with it. One other point the toad gets 30mpg and last trip I drove the toad over 8000 miles. That is not counting the in tow miles. I dont see a significant difference with the Jeep but the Saab on a dolly ... I loose a few miles. I wont start that thread but I usually never leave home with out the toad. Maybe to get gas or something. As someone stated above, it ALL DEPENDS on how you use your rig. On our 12,000 miles USA trip last fall, there wasn't anyplace where we couldn't take the van... Now, that's convenience....no rental car, no extra fuel costs, no extra rental insurance costs.. nothing extra..
We travel part time and have the great outdoors...the whole point of going traveling is to see things.. many of them are outdoors... where there's plenty of wide open spaces ..
Oh, by the way... my little Sprinter has a tow capacity of 5,000 pounds..no kidding. We broke camp with the Class C and day tripped with it in the years prior to owning a toad. Had it been me and the DW it wouldn't have been such an issue, but still an issue. The coach size wasn't the concern its all of the stuff, then toss two kids into it ILL NEVER DO IT AGAIN! By the time we set up the outdoor stuff, chairs, outdoor cooking, grill, patio mat, water, cable, sewer and electric, surge protector locked to the tower etc...etc...etc.... inside makeup, curling iron, (not me them , Not putting my foot in my mouth Carl , I see you grinning as I clicked send ) kitchen stuff comes out of the cabinets, DW brewing sweet tea, Slides out, window awnings deployed, etc.etc.etc that coach isn't going anywhere . Not too long ago I watched a couple break camp without toad, left there stuff out, when they came back it was all cleaned up by the office, they thought they left a day early and weren't coming back . While the coach portion only takes me a few minutes, its all of the other stuff that I wipe down before it goes back under the coach in the basement that can take up some time that I have no desire to do multiple times on a trip. Then there is the security aspect, my stuff is at the campground, while our toad is parked where ever while we are out walking around some quaint town window shopping. You read many times how someone's RV was broken into at a parking lot, easy target and they know there's a good chance there will be valuables left inside.